•	Slide a bolster and/or folded blankets in between the thighs. •	Exhale and extend forward, laying the trunk out over the padding. Make sure your entire trunk, from belly to head is supported. 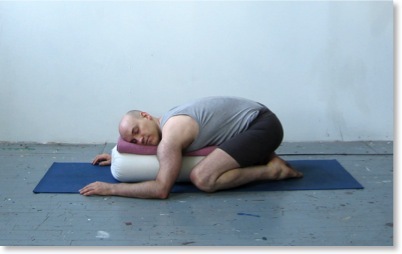 •	Release into the pose and hold for 3-5 minutes, turning the head at the half-way mark. •	Soften and widen the back body, allowing it to be filled by the breath.